Keep it simple – a board, a KIALOA paddle and excellent performance wear. That’s what I love about SUP – in any type of weather. So last Sunday we headed out in a bit cloudy chill of 50 degrees, so I decided to wear my Sweet Waterwear Ka’iulani Zip long sleeve with the neck zipped all the way. I was nice and warm, with plenty of soft, flexible fabric keeping the comfort level high. If you look at the picture to the left you can see that the back of my hand is covered. This is a detail i wish I had a few decades ago – before the sun crisped my hands and got them all “old lady” on me. I wear sunscreen – liberally – but it does wear off quickly. I love the ample thumb-hole at the end of the sleeve, the comfort of the fabric covering my hand, and the sure grip afforded by the texture of the soft, breathable mesh where it comes in contact with my paddle. By tucking my thumbs into their keeper, the sleeve gets a bit of a stretch – no bunching up around elbows or riding up on the wrist. 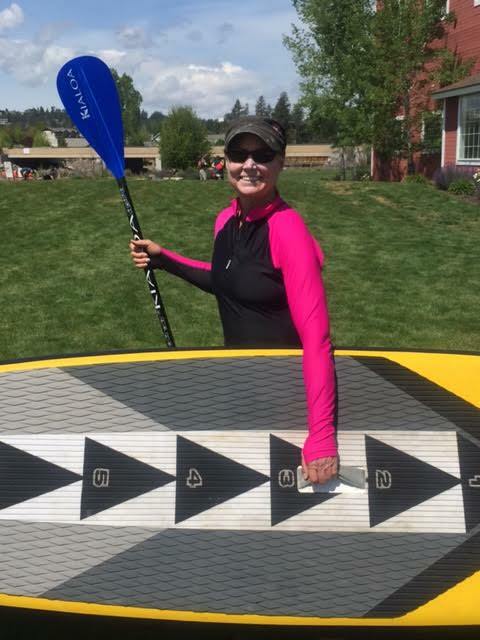 Even on my cool Oregon Sunday paddle, it wasn’t long before I had unzipped all the way at the neck – allowing nice fresh breezes off the Deschutes to dissipate the heat generated by my intervals. With a clever one piece “Hip to Hand” soft side mesh panel breathability and comfort is perfect. It’s the sign of great performance gear when you almost forget about the features and simply have a better paddle because of them. While I am pretty darn stoked about the colors in my Ka’iulani top, comfort and function combine to make this my favorite! There’s even more coolness. I took my iPhone 6 along for the paddle both for photos and some tunes. I have a waterproof case, but I always need some sort of waist pack to carry it. That’s not the case when I wear my Ka’iulani. There’s a cleanly integrated big (and secure) back pocket just right for my cellphone, an energy bar and some extra sunscreen. That’s why you’ll find Sweet on many of the best in the world. Team SWEET OHANA continues to grow. Candice, Andrea, Annabel, Terrene, Silvia and Olivia – and YOU and me!!! High quality, function, design – pretty great combinations to make decisions about what to wear for SUP fun, training, competition and style super easy. What a nice “Sweet” post & review. We are so glad that you love your new Sweet Waterwear Ka’iulani Long Sleeve top. We designed it for function, fashion and versatility & I think we hit that “Sweet spot”. Get out there & enjoy your summer SUP’n time.